I still remember those days when I worked as a trainer to a group of youth as part of Documenting Southern Hebron Communities Project. The young people represent several communities (Tuwani, Maghayir al ‘Abeed, Susya, Umm Tuba and al-Mufaqarah) and their participation in the project was to become field researchers in the subject of oral history. I spent long days and I had several experiences with them. I learned a lot from them; I met new people; and I got to know very close details of their daily lives, the place where they live, their different types of accommodations (cave, tent and house), their movement from one place to another seeking their livelihood, their traditional way of living, their dreams and aspirations, their love to their land and homeland, their love to freedom and their hope for a new dawn that declares their freedom and their return to their land, and their belief and determination to enjoy living regardless of its hardship and cruelty. I learned about their families and the people of their communities, their customs and their traditions. I heard their personal life stories and experiences, the history of their forefathers, their abandoned villages, their rich memories, the story of their eternal relationship with the land through which they formed a beautiful heritage that is full of beauty and diversity; and one that represents a comprehensive life that reflects the strong relationship with land at all aspects. Through this relationship, they formed a collective popular memory that portrays their customs and traditions, joys and pain, rituals and beliefs, and popular season and occasions. These seasons and occasions have a special importance in their popular conscience for land provides people with basic products/needs necessary for their continued living; and for it possesses qualities of good and bright life. It give them its output and has had an effective role in people’s life; and around it are many stories, proverbs, songs, jokes, riddles, and games. I learned about the concept of grazing and the importance of dairy and livestock products as their main source of livelihood. This is in addition to the importance of the cultivation of grapes, olives and grains, and other types of plantations and the resulting rituals and practices that contributed to constructing a clear identity. I was an eyewitness to their steadfastness and challenge to the Israeli soldiers and settlers who keep attacking them, trying to drive them out of their land in order to turn it into a settlement under the occupier’s control. I also witnessed the occupier’s inhuman practices which reflect the mentality of the brutal occupier who wants to usurp a place that is not his and claim that it belongs to him and his forefathers. I remember that day when I was on my way to Susya – a beautiful village overlooking the charming hills to the Southern Hebron mountains, whose inhabitants were expelled on the pretext that it is an old Jewish town which was later turned into an archaeological site that prevents its people from entering it. The families of Susya insisted to stay near their village and decided to live one kilometer away where the agricultural lands are. They live in tents and caves and are awaiting to return to their village. Today they live under the threat of displacement and are constantly at risk of having their homes demolished. I saw flocks of settlers attacking a family that lives on its land and they were trying intimidate them so that they leave their land. Their attempts failed as people gathered and rallied, expressing their resentment of what the settlers were doing. People resisted the settlers and prevented them from getting closer. How wonderful it was to see children, women, old people and young people confronting the settlers with all of their strength, determination, persistence and perseverance. I was struck by the power of the children who began to sing and cheer at the aggressors without fear and without relentlessness. I took some pictures and asked one of my students to interview the family and the participants and include it in our records of oral interviews for the project. It was more than an experience, part of it was painful, and the other was joyful, interesting and challenging. One of the days that got carved in my memory was the day of harvest (June). The field was beautiful and charming as it was dressed in wheat spikes and barley as if it were a beautiful colorful carpet knitted by the women of the area. Charming and inspirational with its desert, mountains and plains; with its wonderful people who create hope from the impossible. I saw families on both sides of the road working in the wheat fields, men and women harvesting barley and wheat using the sickle that our ancestors used for the same purpose tens of decades ago. I watched children playing and enjoying their time. I stopped for a while and approached them and I began talking to them and conducted field interview. What was interesting to me then was when I asked the children about the reason they came with their parents. The answer was that they wanted to help them and learn how to harvest. They talked about their love for the land and their love of being there and playing traditional games in the field. I asked them to play a game in front of me and they chose to play the badge game, a game I had not known before. I also learned the names of areas and details about the harvest season I got to know for the first time in my life. I finished my interview and completed my journey to Susya to bring Fatima (one of my students) to go to Al Tuwani where the young field researchers were waiting me to conduct a group interviews about the harvest. I got stopped by a man who was harvesting wheat and barley in his field. I got out of my car and asked him if he would give a consent for a field interview with him and he agreed. I brought Fatima and we went to Al Tuwani to bring the girls and the photographic equipment and we went back to the field where the man was. We began to interview him about the area, the names of the communities and the land. We also asked him about his experience when the Israeli soldiers assaulted him and shot him in his abdomen and all about the healing process which took years. We asked him about the wheat field that got burned by the settlers whose marks are still visible on the ground. We talked about his determination to sow the land despite the constant threat by the settlers. During the interview a patrol of Israeli soldiers passed by and surrounded the field and the farmers as if there were a commando operation. I approached them and asked about the reasons of their presence. They responded as saying that my car had an Israeli number plate and what I was doing in the field. They told me that I could be subject to any threat while in the area. They told me that I should not be in the area and that I should leave, otherwise, I would be fined. I got very upset, but I did not want to cause any troubles neither to the girls nor to the man. 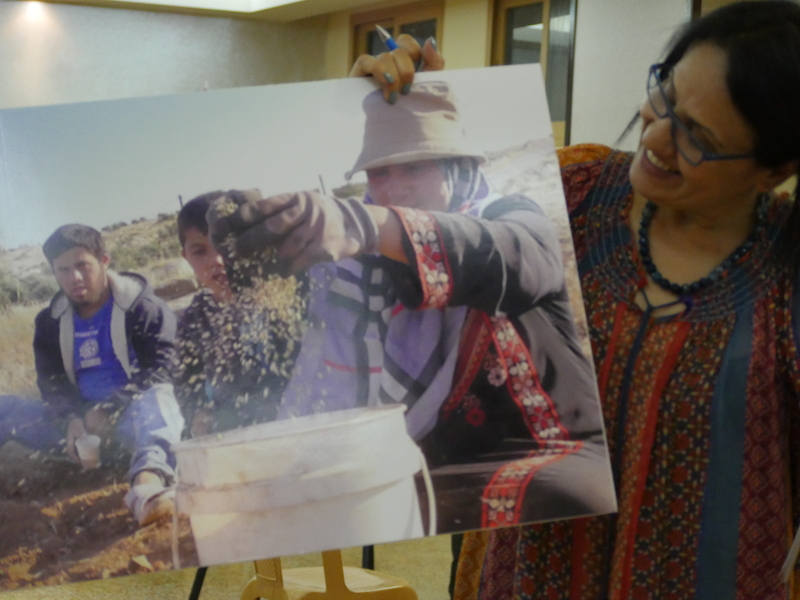 I told them that I was a cultural heritage researcher and while I was on my way to Be’er Sheva, I noticed how farmers harvest with the sickle and I wanted to document it and I would be leaving as soon as possible. How painful it was to feel that the occupation classify me as an Israeli because of my car, yet what was more painful is their claim to protect me from my people…my people who suffer from their practices on a daily basis. We went to Al Tuwani afterwards where we witnessed the village women sieving the wheat and I saw for the first time how freekeh is made. The young girls (field researchers) and I continued our tour and we arrived to Yatta to meet an elderly man who is 98 years old. We were warmly welcomed by his sons and grandsons who sat around him to listen as he narrated his stories. We listened to his story since he was in the village of Al Qaryatain where he and his family were expelled in 1948 to Susya then again to Yatta. He told us about his dream that got scattered as the days passed, about his plans that were cancelled, about his lost love, about his home that he wished to build, and about his land that was stolen from him. How painful and joyous it was to listen to his joyful story as he told us about his home village (Al Qaryatain) and the sweet memories surrounding it, and the moments of pain and sadness when he left it, leaving behind a rich memory full of various events. I will never forget his passion as he was telling us the story of his village, his eyes were examining us at times and were looking full of angers at others. He then would ask some question as “where are you coming from? And why do you want me to remember? You came to revive memories that were about to disappear….Alas on the old days…why are you talking about the past? I do not know and I do not remember…Al Qarayatain is gone and Susya is gone…. and nothing is left except memories…joy has disappeared and we are just waiting to die. Despite his refusal to talk at the beginning, he started to thoroughly talk about events that are carved in his memory…some of which he narrated for the first time. We were attentively listening to him as he was singing some folklore songs about his village or when he randomly chose a topic to talk about. How beautiful it was when he sang for his village with his eyes full of tears…tears that showed joy as he remembers the singing circles in the past. I watched the astonishment on the faces of his grandchildren as if they met their grandfather for the first time. There was an overwhelming silence as they were trying to understand what was going around them. Who is being interviewed? Is this our grandfather? Why is he narrating these stories? Why have not we tried to know him before? Why have not we felt his pain before? Why have not we tried to know our history? We have not we listened to him before? You could see how proud they were about their grandfather and his experience and memory, and how passionate they were to know more as they were telling him tell us more…we want to know more. At the end of the interview, he dedicated to me a popular spoken word poem. We agreed to set a date for him to accompany me to his village Al Qaryatain to conduct an interview with him at the presence of his children and grandchildren who asked us to return for this purpose. I returned home and I felt heavy loaded with lots memories, images, thoughts, and fears and pains…what needs to be done to continue with this project. What needs to be done to preserve these memories? Or where to start? Interviewing the elderly people who have the memories of their villages and communities before they were expelled seemed to be highly important…to collect the remaining of popular cultural heritage is also very important. So I was not sure if we shall begin by documenting villages whose people were repeatedly displaced? Or shall we begin with villages at risk of being displaced? Shall we conduct a survey for the purpose of redrawing the map to put these communities on their actual location? Or shall we establish a museum that tells the story of Southern Hebron communities so they remain alive in our memories? Or shall we draw paths so that the people of the world would know what Israel has done to displace and steal our heritage? Or what else? Many ideas are hunting me and are constantly on my mind, drawing many big dreams for the memory of my people…my powerful people.